There's always more if you're willing to dig deeper. Beyond a shadow of a doubt, the world is enamored of the late Leonard Cohen's "Hallelujah." It's a magnificent achievement in song, and in no way should it be undervalued, but it's perhaps as widely misunderstood as the Police's "Every Breath You Take" (a stalker monologue people played at their weddings). "Hallelujah" sure sounds like a hymn, but the religiosity many listeners ascribe to it is undercut by its acquiescent stance on romantic love. Not a victory march. Cold. Broken. What's inherent is a difficult surrender, among other things. 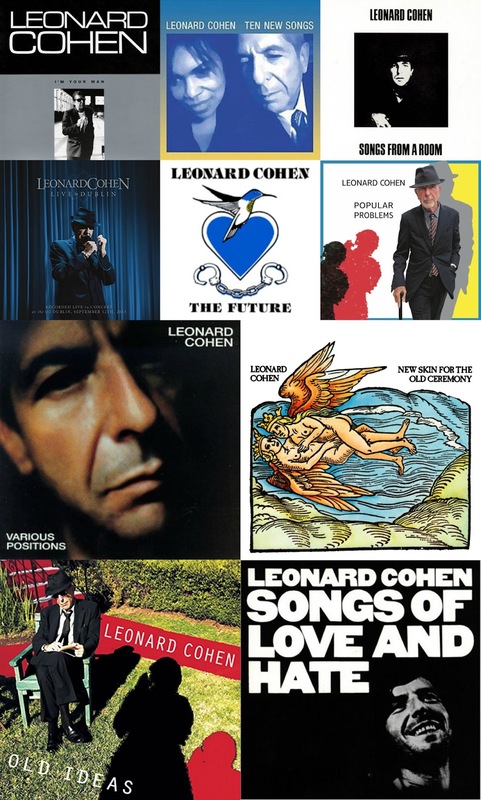 It's a mild source of frustration for so many Cohen fans, then, that this ubiquitous, American Idol-ized song has been embraced to the utter exclusion of his remaining musical repertoire—a veritable diamond mine sparkling with poetry, profundity, libertine angst, and gallows humor. "A Bunch Of Lonesome Heroes" (Songs from a Room, 1969) - "I sing this for your children / And for all who do not need me," Cohen sings in the nascent stage of his career. A jangly, elegant ode to troubadours destined to be forever misconstrued. "Avalanche" (Songs of Love and Hate, 1971) - A shadowy early moment, marked by a tense, finger-picked guitar and spiritual defiance: "Your laws do not compel me / To kneel grotesque and bare..." Poetic and ominous, one can practically hear Nick Cave's entire aesthetic being born right here. "Field Commander Cohen" (New Skin for the Old Ceremony, 1974) - Cohen once described touring as something of a military campaign, so given its title, it's fitting this acerbic, self-aware march (a key line: "parachuting acid into diplomatic cocktail parties") made it into his live shows. He might be the "patron saint of envy" and "the grocer of despair," but he's still "working for the Yankee dollar." Oh, the trying nexus of art and commerce. "If It Be Your Will" (Various Positions, 1985) - "From this broken hill / I will sing to you." A solemn prayer from the same album that yielded "Hallelujah." Never living an unexamined life, Cohen seems to meditate on his role as an artist and performer, accompanied by the lovely backing vocals of Jennifer Warnes. "Jazz Police" (I'm Your Man, 1988) - An exotic, synthesizer-flecked escapade, this track stands as one of the strangest volleys in the Cohen songbook, which makes it all the more compelling. And hey, feel free to decode the lyrics if you're feeling brave ("Jazz police are paid by J. Paul Getty"...huh?). Otherwise, piano, electronic beats, and backing singers swirl around in a late-'80s neon purgatory, demonstrating Cohen's taste for sonic adventure. "Democracy" (The Future, 1992) - "I love the country / But I can't stand the scene / And I'm neither left nor right / I'm just staying home tonight / Getting lost in that hopeless little screen," Cohen declares, offering incisive commentary and a frighteningly accurate vision of the future. Don't let the gentle, airy musical arrangement deceive you; there's a storm brewing here... "Democracy is coming to the USA." "I caught the darkness / It was drinking from your cup." "A Thousand Kisses Deep" (Ten New Songs, 2001) - "You live your life as if it's real / A thousand kisses deep," rasps Cohen on this 2001 ballad, a standout from Ten New Songs. The illusory nature of love and life is examined, as Sharon Robinson's angelic vocals float alongside of it. The chiming guitar notes are like tolling bells. "Darkness" (Old Ideas, 2012) - Mortality became a permanent passenger in the vehicle of Cohen's music as his hour drew nearer: "I got no future / I know my days are few." Sounds like a downer, but there's a bracing churn to the music, and inescapable wisdom within this hedonist's reconciliation. "I caught the darkness / It was drinking from your cup." "Slow" (Popular Problems, 2014) - "It's not because I'm old / It's not the life I lead / I always liked it slow / That's what my momma said," this deliberate ladies' man explains to a little red corvette over a pulsing rhythm. He continues, "All your moves are swift / All your turns are tight / Let me catch my breath / I thought we had all night." And in the middle of this romantic negotiation, he breaks down: "So baby let me go / You're wanted back in town." Baby, you're much too fast. "Save the Last Dance for Me" (Live in Dublin, 2014) - A Drifters cover that was the frequent closing song on the 2012-13 Old Ideas tour, this moment from Live in Dublin reminds the listener what a truly wonderful coda it was. Drawn skyward by the choruses of Robinson and Charley and Hattie Webb (the Webb Sisters), Cohen's deep resonance with his adoring fans is distilled beautifully here, as they clap and sing the chorus along with him. A grace note.